When it comes to your ice fishing tackle, water giveth and water taketh away. As much time as your baits spend submerged in the winter, once the ice goes out, your jigs and spoons shouldn’t come anywhere close to water. Keeping your baits dry over the off-season will ensure their effectiveness next winter. If you discover moisture in your tackle boxes, remove all the baits, hooks, sinkers and terminal tackle and wipe out the trays with rags or paper towels. Leave out the baits and trays overnight to dry. “Do this indoors, as precipitation and condensation can reintroduce moisture,” Hawthorne says. After everything dries completely, re-fill and re-organize your tackle trays, adding a small dessicant pack or two to each box. Dessicant is a substance that induces or sustains dryness in its vicinity. Common desiccants, such as silica gel, are solids that adsorb water. Silica-gel packs come in almost every box of electronics and many other products you buy. “Instead of throwing them away, save them for your tackle boxes,” Hawthorne says. Even if you carefully dried everything in your ice-tackle boxes before you stored them for the off-season, humidity in hot garages, sheds and basements can re-introduce moisture. Dessicant packs will prevent this. 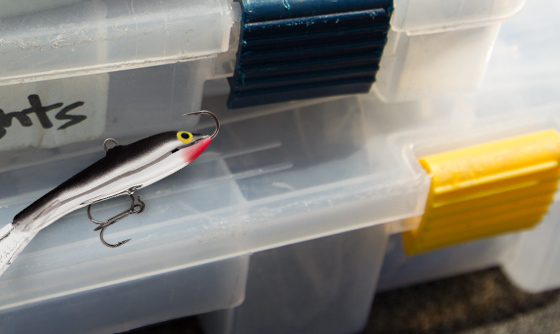 If you find evidence of rust forming already on your hooks, you can save them from harm with some salt, lemon juice and a hook hone like the Rapala® Hook Sharpener. This entry was posted in Tips and tagged Brad Hawthorne, ICE FORCE, Rapala. Bookmark the permalink.